On May 17, 1954, the Supreme Court outlawed racial segregation in public schools in its landmark Brown v. Board of Education ruling. The Supreme Court ruling in Brown v. Board of Education of Topeka, Kansas, had an impact on school districts thousands of miles away. Barnard School, in Washington, D.C., above, was integrated a year after the Brown decision. 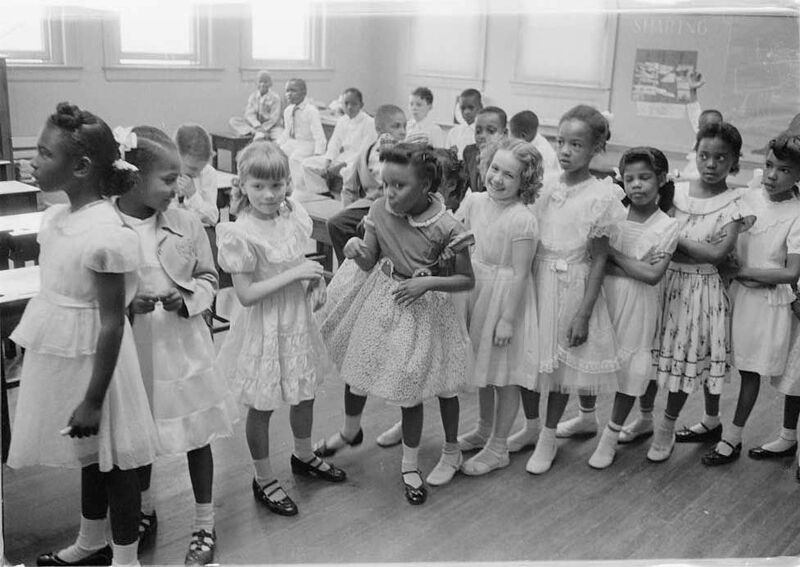 On May 17, 1954, the U.S. Supreme Court outlawed racial segregation in public schools. The ruling, ending the five-year case of Oliver Brown v. Board of Education of Topeka, Kansas, was a unanimous decision. The Brown decision had an enormous impact on public schools in the U.S. In Topeka, elementary schools desegregated within two years. (Middle and high schools were already integrated.) However, not all states accepted the Supreme Court’s decision. In Virginia, for instance, a campaign called “Massive Resistance” opposed desegregation. Many public schools in Virginia closed down rather than accept integration. Virginia did not entirely integrate its public schools until the 1970s. group of elected officials who decide educational policy for school districts. to withhold or prevent from using. to end segregation by race. policy or system of teachings. intrinsic, or existing as an inseparable part of something. process of mixing different substances or groups. geographic area whose schools are managed by one administration. to bring a lawsuit against a person or organization. being totally united in support or rejection of an idea or vote. against the laws of the United States Constitution.